Previously I had speculated in a post, Trying to get a grip on the impact of subprime mortgages on low income families, on what I thought was going to be the impact of subprime mortgage crisis. 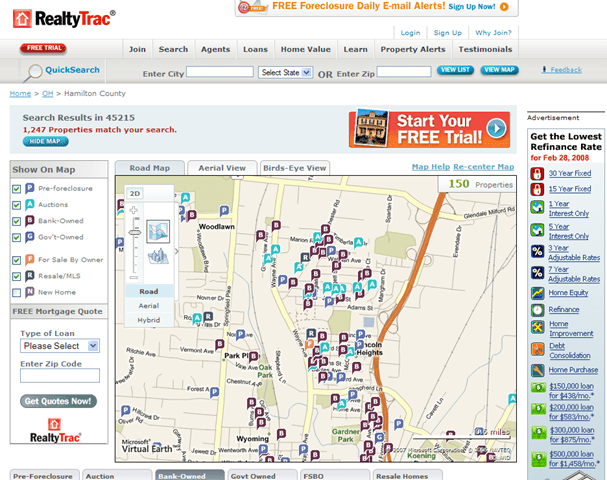 Yesterday I decided to see what the folks at RealtyTrac said for a low income area I am interested in. The numbers are not pretty. Lincoln Heights is the triangle in the middle of the map where most of the pushpins are located. There are around 1600 occupied houses in the Lincoln Heights community according to City-Data.com and something like 125 houses in foreclosure. This means that about 8% or 1 in every 12 houses in Lincoln Height are in foreclosure. The folks at foreclosurepulse say that it is likely to get worse. Read it and weep!